New England Patriots Player Profiles: Will Julian Edelman Be Healthy Enough To Be The Top Receiver? | NFL News, as it happens, when it happens. Your one stop shop. New England Patriots Player Profiles: Will Julian Edelman Be Healthy Enough To Be The Top Receiver? Without a doubt, the best wide receiver on the New England Patriots roster over the past two seasons has been Julian Edelman. Over the these last two years, Edelman has brought in 197 receptions, for 2,028 yards, and 10 touchdowns. Edelman’s role has greatly increased since Wes Welker departed for Denver in March of 2013. Edelman was drafted by the Patriots in the seventh round of the 2009 draft out of Kent State, where he was a read option style quarterback. In his rookie season he played in only eleven games. However, he still managed to be a solid third string wide receiver catching 37 passes, for 359 yards, and one touchdown. In the years 2010 through 2012, the Patriots had the league’s best offense, with the emergence of the two tight end attack of Rob Gronkowski and Aaron Hernandez, along with Wes Welker consistently catching one-hundred balls. With all that production, with some injuries added in Edelman took a back seat on offense. Nevertheless, in 2011 when the Patriots had some serious depth issues at the cornerback position, Bill Belichick used Julian Edelman’s athleticism to his own advantage. During that season, where the Patriots were at the bottom of the league in pass defense, Edelman was used heavily in nickel defense at nickel back. He was exactly Deion Sanders, but he was better than expected for a guy who played slot receiver. His versatility has made him a prototypical Bill Belichick Patriot. In 2012, with Welker’s future with the Patriots in jeopardy, Bill Belichick began to plug in Edelman more at the top slot receiver spot. However, as was the case throughout most of his career he got injured. A fractured foot on Thanksgiving against the Jets, lead to Edelman being placed on season ending injured reserve. In the offseason of 2013, Edelman became and unrestricted free agent. 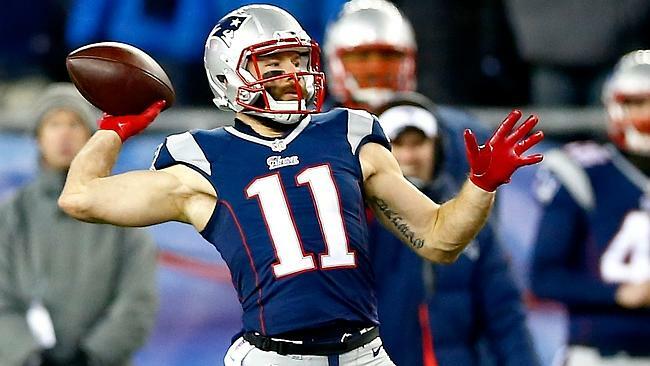 After receiving virtually zero interest from other clubs, besides one visit of the New York Giants, Edelman returned to the Patriots in April signing a one-year veteran minimum deal. He needed to prove that upcoming season that he could stay healthy and be a reliable number one receiver. He did just that, beating out Danny Amendola for the top wide receiver spot and catching 105 passes, for 1056 yards, and six touchdowns. In a season where Rob Gronkowski and Danny Amendola were hurt for most of the time, and rookies such as Aaron Dobson and Kenbrell Thompkins had to be first team players, Edelman was the one saving face. This past season, Edelman was as reliable and clutch as ever. His regular season number speak for themselves, but in the playoffs is were he really shined. Most notably in the divisional round and in Super Bowl XLIX. Late in the third quarter of the divisional playoffs against the Baltimore Ravens the Patriots were driving down the field trailing 28-21. Brady threw a parallel pass to Edelman on what looked to be a screen. However, he pulled up and fired a picture picture perfect pass down the sideline to a wide open Danny Amendola for the game tying touchdown. In the Super Bowl, the Patriots trailed by ten points in the fourth quarter facing a third and fourteen play that could end the game. Brady rolled around the pocket and fired the ball into the middle of the field right into the hands of Edelman who was absolutely clobbered by Kam Chancellor. Later in the game Edelman caught the go-ahead touchdown pass to give the Patriots the 28-24 lead. So far this season, Edelman has not been able to get on the field to often due to a nagging ankle injury. He did not travel with his team to West Virginia for joint practices with the New Orleans Saints. 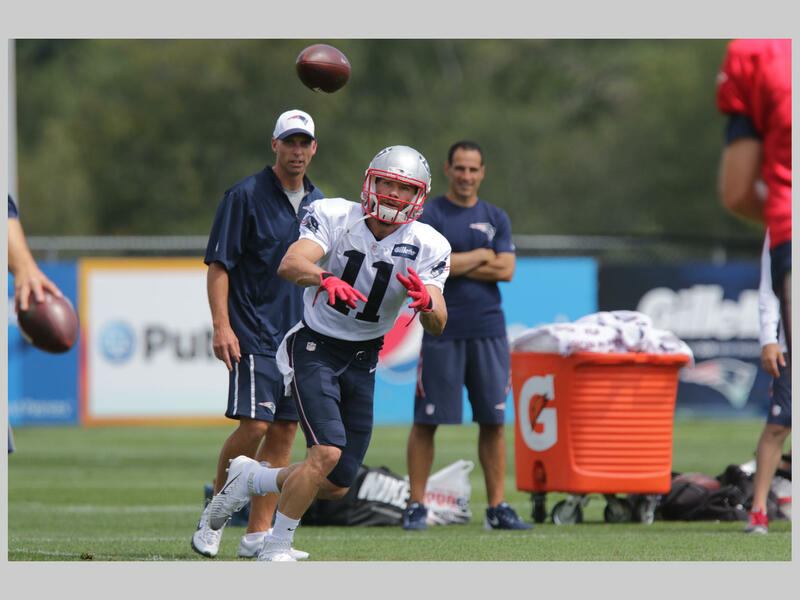 It is a bit alarming that Edelman has not been on the field hardly at all this summer, but for a player with as much experience in the offense that he has you have to expect that he can just jump right back into action. It is best to be precautionary with him because of his importance to the team. Julian Edelaman is such an important player to the Patriots offense because he serves almost as a spark plug. Whenever you need a first down conversion or a big gain, go to Edelman. Also, he has always been able to spark the team with a solid punt return to put them in good field position. In conclusion, health will be the biggest question mark for Edelman in 2015. At a position where players take such as beating the risk of injury is so high. In addition, Edelman has not suffered a serious injury since 2012, and you have to believe that he is at a high risk of injury this year. If he can manage to stay healthy, pencil him in once again for about 90 receptions and near one-thousand yards and being Tom Brady’s favorite target.